Here it is!!!!! 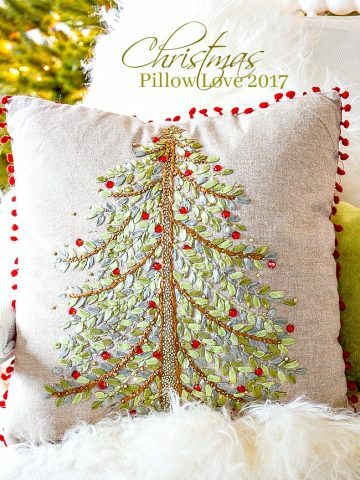 The 2016 edition of… CHRISTMAS PILLOW LOVE! I’ve scoured many of my favorite pillow sites to find the best- of-the-best Christmas pillows and feature them all in one place! We have pom poms and black labs and chalkboard signs and glittering reindeer and on-trend plaid and holly and Christmas trees and Santa and his sleigh! This year’s pillows are fun and chic and fabulous! I’ve even put a few pillows together to make perfect little Christmas collections! Come on… I have lots to share! Every year I buy at least one or two ( okay, sometimes more) new Christmas pillows. This year I’m decking StoneGable’s halls with #1 and 2 and 4 and 32. And I’m thinking about #8… a gorgeous classic Christmas toile on one side and plaid on the other! But seriously I could take them all! Enjoy all the Christmas pillow love! Many pillows are on sale now! It’s one thing to have a fabulous Christmas pillow or two or ten, but they really should be paired with another pillow or two that work as a great “background”. 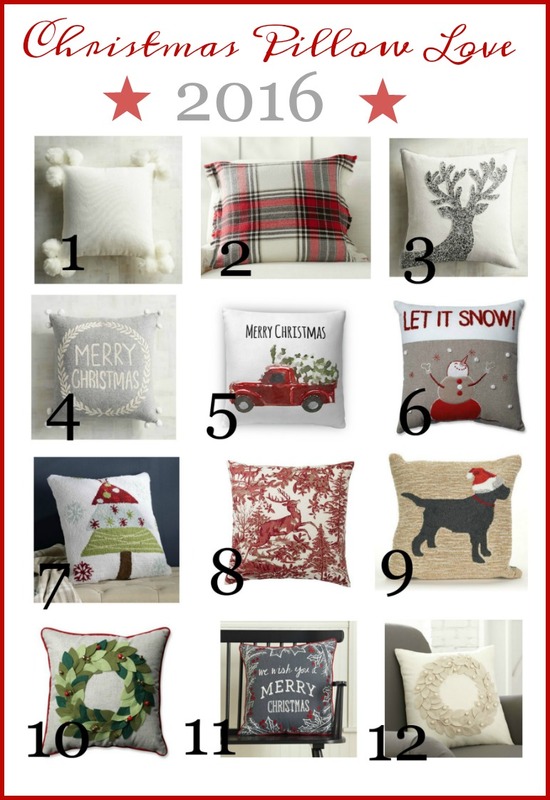 Here are my picks for Christmas Pillows In A Supporting Role! I have two #32’s for my dining room this year! And #23 and #37 are begging me to bring them home! Okay, 28 too… and 29 and …. I am the “pillow whisperer”! 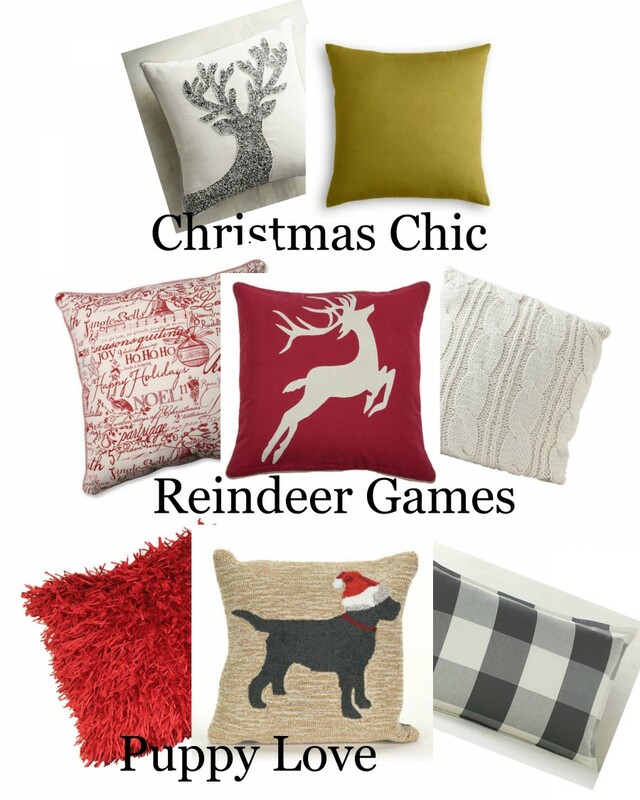 Now let’s mix a few pillows up for a a FABULOUS Christmas look from the 33 choices above! This can get a little addictive! Tons of options! It’s really not about one fabulous pillow… but about a fabulous COLLECTION of them! I hope this has inspired you! Christmas pillows are an easy and fun way to add lots of Christmas cheer to any decor! Now what pillows are whispering to you? Did you know I have over 32,000 pins on my Pinterest boards? You might like to follow me on Pinterest and see what I am finding to pin ever day HERE. All are beautiful pillows……but way toooooo pricey for me! Thanks for sharing. I love your home. Thanks for the many pictures of your pillows. I love to make pillows and have been making them out of the most unusual fabrics. Right now I have a lot of sweaters that I am turning into pillows. Merry Christmas! I love them all and have too many myself. Pillows can completely change the look of the room. Those pillows are so Christmassy. I especially like the ones made with buffalo check fabric. I want them all, naturally, BUT I know that isn’t even feasible, BUT I still like looking at them! Everything is beautiful. Will you post what source the pillows came from ? Hi Cathie, All the pillows are numbered and you can find the corresponding number and click on the link. It will take you right to the source. Hope this helps. Thank you for this blog about Christmas pillows! They are beautiful! I love them all! I just made a burlap snowflake pillow..next I want to make yr button snowflake pillow..Thanks for compiling all these pillows to we can drool over them!? Oh my, I want them all. What a great color pallet. I am a “sucker” for pillows and especially Christmas ones!! Thank you for doing the research and sharing so many wonderful ideas with us! 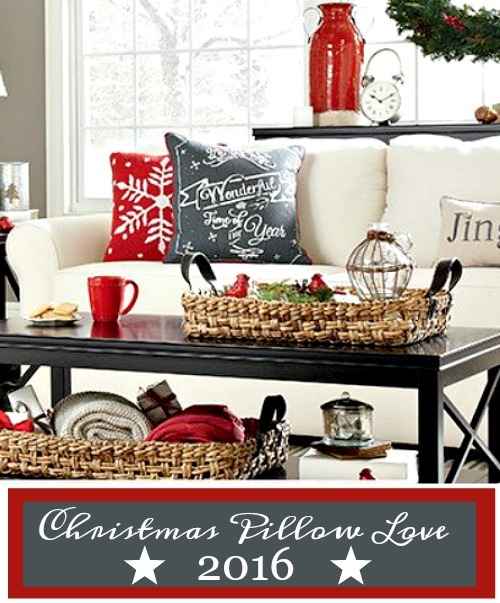 I’m definitely in the mood now to get out my Christmas pillows and start decorating…. Oops! I just realized you didn’t show the pillow with the red beetle from Craftberry Bush, but I noticed it on one of your other posts…maybe photos from last Christmas?! Anyhow, I love that pillow. I love pillows! Thanks for sharing all of these pillows, I like them all but especially the little red beetle from Craftberry Bush! I need to order that one! Thank you for sharing. I love Christmas decorating and I am always looking for something new to collect and this is a great idea. It would also make a nice gift collection for my daughter and her new home. Love your blog! I love 2 and 3. I have been looking at your blog all morning. I have not been in the mood to get anything out for Christmas but after reading and seeing all the beautiful pins I think I can tackle my garage today and pull everything out. I am absolutely getting clear bins after church today so I can store away and organize what I don’t want this year or to Goodwill it will go. Thank you for the inspiration. I needed it desperately! I love everything. Your home is just wonderful. Thank you for sharing. I love pillows and the inexpensive way to change the looks in my rooms. 2,21,28,32-if I were buying this year! I love them, but I have a time finding ones that don’t clash with my chairs (that need recovering). Maybe by next year! I just bought the cutest Christmas pillow at Steinmart – red pickup truck with Christmas tree in back – like the green pickup/pumpkins. PS: At a fraction of the cost of the pumpkin pillow! #22 from Pottery Barn is looking quite festive on my sofa. I am in ❤️ with it! ?? It’s nice to see someone else loves holiday pillows as I do. So far I have added three pillows to my collection. Thanks for sharing all of these beautiful pillows. Beautiful pillows. I am amazed at how a few well placed pillows adds to the decor. Guess I have a lot to learn – thanks for teaching me. Yvonne, it’s so nice to see so many pillows in one post. I, too, love pillows for every season. They definitely brighten and enhance each space.im going to buy se real new ones. So many cute options and styles to suit everyone’s taste. Thanks for making the hunt easier. 16 , 22 AND 5 Ohhhhhh so many to choose from thank you for sharing and yes they really do round out the decor and my faves are the feather ones…just yummmy. That black lab pillow makes my heart beat faster. Thank you for providing the sources to purchase these lovely pillows. Love the Reideer Game set! We live in Grand Island, NY and are near the woods. Many times reindeer visit us during the winter. Last year, while our grandchildren were visiting from Atlanta, several visited us on our deck on Christmas Eve! What a thrill for all of us!! Love the pillows, ALL of them! You can never have too many pillows. I try to add a couple of new pillows each year to my Christmas collection…….Thanks, Yvonne for making my shopping so much easier this year ! Decisions, decisions – thanks for narrowing down the field! So much fun trying to decide. Oh my , so many more choices, but they are all cute. I also like the red and cream or white plaid. I love pillows too! I think I could have a whole closet full of them! I love the doggy one…so cute! I am a dog lover so there is always a doggie pillow included! What a fun post and unbelievable prices (which I will tell hubby) when he sees the sweet red truck pillow on his chair. We have a 48 chevy pick-up so I know he will get a kick out of it. Thank you for the work that went into putting this post together your wonderful! My favorite is #5. I love the old pickup trucks with a tree in the back. It screams country Christmas!!!! 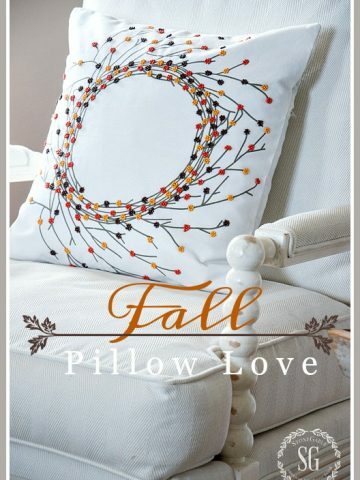 I love decorating with pillows, I try to change with each season. Trying to decide which ones for Christmas I can’t live without. You can find that basket at Birch Lane! FUN,FUN, FUN!! Love your collections!! I have a thing for pillows as well and after a color choice is made, pillows are my jumping off point!! I love ea and every one but they are a little outside of our SS budget. 🙂 NOW…if I am blessed to win the 100.00,, I might could buy a couple new pillows. Thanks so much for the inspiration. Yes, it is reversible! I’m wild over this pillow too! Just gifted a dear friend with a pretty Christmas pillow for her birthday at lunch today. Great idea. Since I am familiar with her decor style, I knew it had her name on it as soon as I saw it in Home Goods. Sweet idea to send a pillow home after Thanksgiving. Oh my gosh! I LOVE that you had this great post! I especially love the group of pillows YOU picked for yourself! It actually made me realize that I already have a white/pompommed pillow that I could just add to with the other cozy pillows! Yeah! Such fun! Thank you so much! I am ALWAYS inspired by your posts! All your ideas are inspirational. I want one of each, let the shopping begin. I love all of these pillows! These appear to be a regular pillow. I recall in one of your posts, you mentioned that you use pillow covers instead of purchasing so many pillows. This saves space. Just wondering if these are covers? Wow love them all!! Can’t wait to put out my new pillows this year. My favorite is the Volkswagen bug with a Christmas tree on the roof. It pairs perfectly with my Pottery Barn Red throw on my black bench in the foyer. Have a blessed Thanksgiving! Enjoy all your posts. I’m definitely Farmhouse Country! I have a pillow fetish as well! Oh what fun it is to- – – pick a cute pillow! What a fun post! There is not a one that would not brighten up my space! Thanks for sharing all the links and thanks for getting us in the spirit! In one week we will be forgetting about Thanksgiving and going full speed ahead toward Christmas! These pillows are a great primer! Wonderful article today &always Yvonne! I absolutely adore all these pillows and hope to narrow it down to maybe 4 as well! Thanks for the inspiration! Adorable pillows! Thanks for doing all the leg work! You are so welcome! 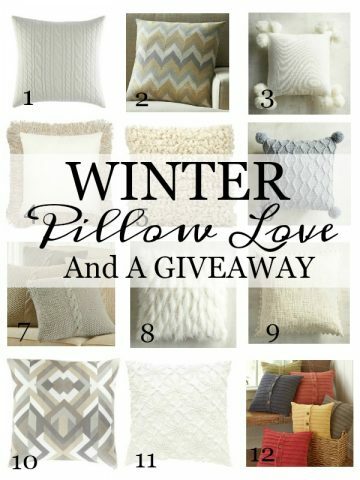 I love putting together these pillow love posts! I love switching out pillows to Christmas. I do it the day after Thanksgiving. I change out the quilts and throws then also. that is the start of my Christmas decorating. From there is just builds until I think it ‘enough’. every year ‘enough’ can vary depending on whats going on. I do love this time of year. So full of hope and joy. Oh how beautiful, Yvonne!! I love the ones you term Snowy Christmas! I’ll have to put them on my wish list!!! Love how you’ve put them together!! Blessings to you!! So many pillows!!! Love it!!! I will choose the re plaid, the mary pillow, the reindeer pillow. Can’t wait to buy some & look more “Christmasie” in my home!!! You always have great posts. 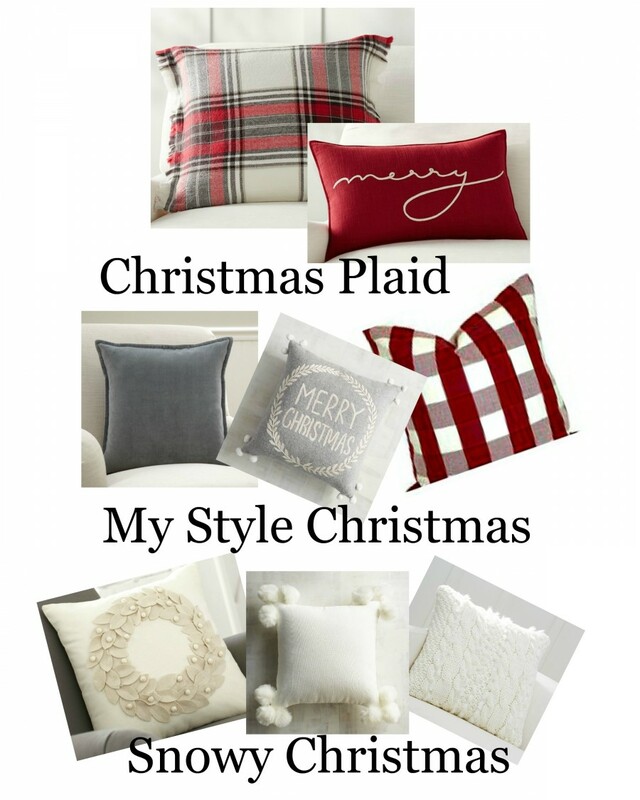 Love the plaid pillows…..thanks for all the choices. I love the truck and woody pillows!!! I love Christmas pillows!!! You are smart to get the covers for the pillows so you don’t have to actually store that many pillows. I unfortunately was not that smart and have a whole container filled with pillows for the holidays. Such a fun way to add something festive to a room. Thanks for all of the great ideas! Thanks for sharing. I love #1 & 8. I love all of them. You did a fabulous job of selecting holiday pillows. I an a pillow collector too! Love the ivory wreath pillow, and the chalkboard one! Thanks for sharing your ‘finds’! OH I love all of them! You have incredible decorating style Yvonne! Some great pillows you’ve selected! Nothing like a Christmas pillow to set the mood! Yvonne: thank you so much for your “Pillow-palooza”. I thought I had enough holiday pillows until I saw this. Thank you for doing all of the legwork for me! pillows are a great idea; useful and quick way to change the looks of a room. Thanks so much for all your research… Loved the Christmas truck so much I just purchased it. Keep those ideas coming! Love all the wonderful choices. Pillows are such a great touch in finishing a rooms decor. Can’t believe Christmas is only 38 days away so I better get busy. Crushing on all of the amazing choices! You make me want them ALL! I love all these pillows and usually our home is decked to the nines for this festive season but having just returned from the bout in the hospital not sure how much I will be able to do this year. I love all your decorations and at least I can enjoy the season with all the lovely things I see in blog land. Blessings to all your family for a magical and holy “Christ”mas! Your posts light up my mood like a Christmas tree, each time Yvonne. How very delightful, this “pillow talk” is, finding it hard to decide which one to choose, think I will go with “Keep Calm and Be Merry” the pom pom’s tug at my heart though. Thanks to your inspiring posts, I find great joy in planning the holiday decor these days 🙂 Thank you, for being the messenger of “JOY”. What a fantastic collection of pillows! Especially love that several can be left out to enjoy after Christmas throughout the winter season. Thanks for sharing! Love all the pillows, but my favorite is the pom pom pillow. Thanks for all the inspiration Yvonne! So many beautiful pillows and only so many places to put them! the special little groupings you created. So inspiring. I love so many of those pillows that it would be hard to choose just one! Tough choice,I’m always mad for plaid. #5.the pick up truck adds a bit of whimsy. Love pillows! Oh, soooo many choices! If I had to choose just one, it would be the old red truck with the Christmas tree. Since I prefer neutrals, I don’t know why but I’m drawn to it! Thanks for all the pillows !!!!!!!! Some really darling ones! And they seam to be reasonable priced! Changing out my pillows for the season at hand is always one of my f favorite things to do! And this year (now that I know your secrets! ), I’m even more excited! I love all of these pillows, but I really love #22 – so I ordered it! Thanks for sharing! 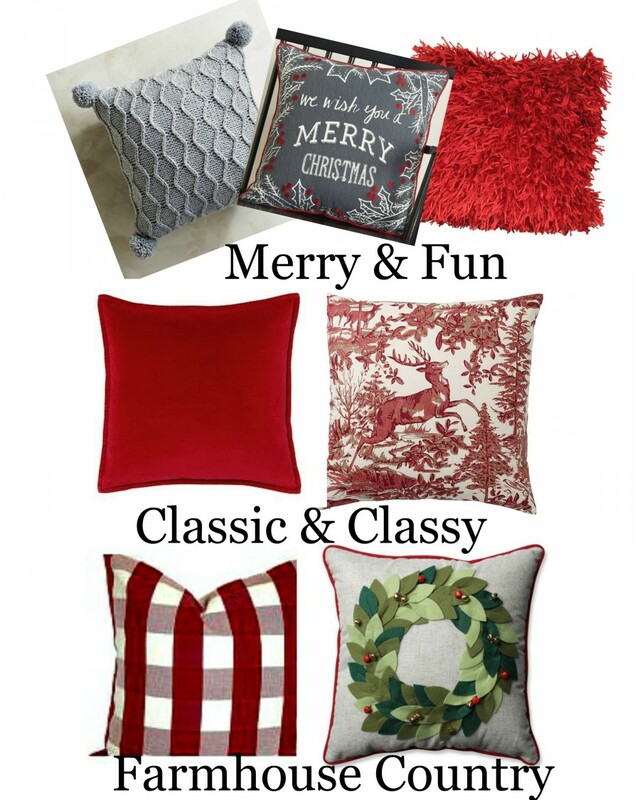 Love your mix of Christmas pillows! Oh my word!! Such pillow beauty! Not only the ones you chose…but when I click on a link, I find hundreds more to choose from!! Trying to downsize is so hard…but I think I will offer up some of my oldies to friends and family and buy a few new ones to keep!! I just got a new loveseat and sofa and am happy to say I could use any one of them. I do like the cream with wreath and the one with pom pom…. nice choices! What a lovely post and all the gorgeous pillow! I have my eye on a few…especially the ones with red and green! I love pillows too but where do you store all of them? I have been pillow crazy this year. I could go nuts buying everything that I like. Especially Christmas pillows. Thank you so much for giving us so much to wish for. I enjoyed looking at so many. I could spend a lot of money. Happy Thanksgiving to you and your family. It won’t be long nest week. Can you believe it? Love your Christmas pillow selections!!! Oh my goodness you have made my day! I love all the christmas pillows. I brought my christmas totes up this morning and now I’m trying to decide which pillows to use this holiday.Thanks Yvonne,you are a jewel! Now, I can hardly wait to go shopping for a few new pillows to add to my collection of pillows. Love Christmas pillows almost as much as I do Christmas ornaments! Enjoyed the post – very inspiring! What a beautiful selection! Thanks for doing all the work of putting this together for the rest of us. Well it has become very clear to me that I need to win this months readers appreciation gift card because I want them all! 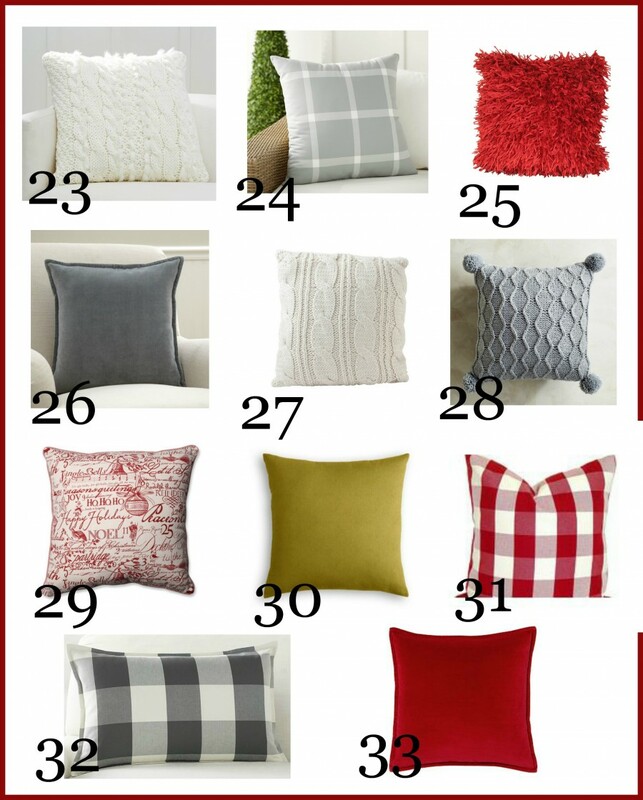 Number 22 is my very favorite, and i love the Pottery Barn plaid ones too. I have a special knack for picking out the most expensive things in any grouping. Just ask my husband. Yvonne, you make decorating so super simple. I really appreciate how just a few simple touches like 2 or 3 new pillows can make a huge difference in the look of my living room and family areas. My challenge is that both my sofas are Christmas red, so I have opted for the snowy Christmas look to my pillows! I have been looking at #22 since last year and I just love it! There are some great ones on your list and I’ve seen some that are not on your list. So many pillows, so little space! Have a great day! I’m so anxious to Christmas “up” the house after seeing all of your Christmas ideas. Keep these pics coming. I love the woody with the tree on top. One year we took our convertible to a tree farm. We set it in the back seat with me holding on to it. Needless to say, we had many stares on a cold December day. I had on earmuffs and gloves. Oh my you have made me PILLOW HAPPY! Love them all but the ones from Pottery Barn have my heart and their on SALE! Oh boy! I love pillows especially Christmas pillows. My husband tells me when I go shopping no more pillows since we are pillow poor. Love your article. So many pillow…so inadequate couch and chair space! I’m lovin’ so many of the pillows found at Home Goods and Target! My problem is storing them after the fact – I need a bigger house! 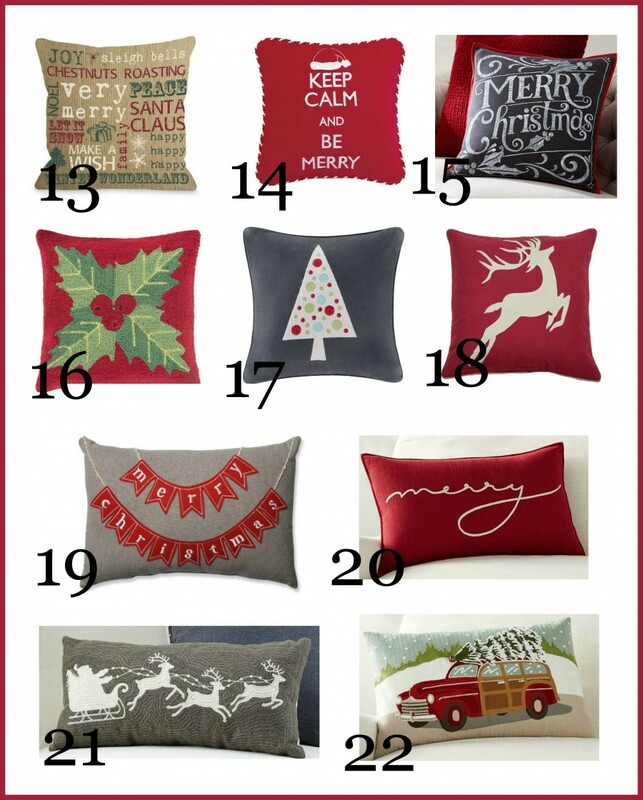 Always love all of your pillow choices, and look forward to seeing your Christmas decorations! Thanks for all the pillow love! The snowy Christmas pillows are my favorite. Yes, yes, yes!!! I love every pillow you have pictured! I am so ready to decorate for Christmas!!! I also have quite a collection of pillows! I’m going with plaid this Christmas, accented with black/white stripe/check ribbons! Can’t wait to get started decorating. Love the doggy pillow and last year I bought Christmas pillow covers with reindeer on them. This way I can just cover my bird pillows with reindeer. Love your decorating style. Such great ideas. I love so many but the truck and tree one you have on your chair is my fav! i usually “let” myself buy one pillow a year. last year, the sales were so good for the ones i’ve been drooling over for years and i had been awfully “good”, so i treated myself to four…. pillows make a room so cozy and inviting. thanks for putting this pillowtalk together! i think i’ve been just as good this year, and probably deserve at least 2 new ones, ha! Oh my gosh – it is so hard to choose! I love all of them! I love toile prints, I always have. I also love the farmhouse style pillows, and any kind of plaid or check. These are great, it’s so much fun to decorate with pillows! Great selection. I love pillows of different styles and have several similar to many of your choices shown. I like changing things around each Christmas, thus more pillows! Here’s to PILLOW POWER! I love all your choices, and would love to add the toile with the plaid back to my collection. Like some that have commented, I am now looking for covers instead of actual pillows since they are easier to store. I know you do the same as you mentioned that in a past post and had photos of the covers in drawers for storage. I always go for a Farmhouse look for the holidays as we finally moved into our own farmhouse this spring and I can hardly wait to decorate for Christmas! Thanks for all your inspiration on a daily basis! Love reading your post you are an inspiration to me with your great ideas about decorating. I love buying just pillow covers and reuse my inserts I will check out these to see if that’s possible! Oh, what fun it is to ride through these beautiful pillows, Yvonne! It’s right up there with going through the Christmas toy catalog! You are amazing. I am enjoying looking at these pillows! I have a couple from years past, but there are some beautiful new ones. Thanks! What a great bunch of pillows and all in one place. I am making a few this year and these pillows give me so much inspiration. I will be scouting the stores to add to my collection. Thanks. LOVE!! Christmas is a joyous time of the year and these pillows are like the icing on the cake! love the pillows! Because of you (!) and your wonderful blog I have discovered how easy it is to change a room’s mood and look by switching out pillows seasonably and for holidays…. but my color scheme puts a bah humbug on the red and green for Christmas so go with whites and greys unless I can find a robin’s egg blue winter/Christmas pillow. I also loved faux fur pillows. I love your thoughtful collections. I am decorating with a neutral, earthy vibe this year and found a couple pillows on your list that I will be ordering ASAP. Thanks for sharing so many cute choices! How in the wold can I narrow these yummy selections down …..I want them all . This post is so “Merry & Bright”. Never new I loved pillows so much till I seen this! I’m on a budget so I’ll be looking for placemats with a similar design and making my own pillows. Thank you for the inspiration! I have a gorgeous cushion in red felt with “Noel” stitched on to it. The fabric for the letters is a mixture of velvet colours and came from old curtains or around 1850 of a large Chateau in the centre of France. The cushion is large and was made for me by a local artisan here in France, each year we bring it out and adore it and marvel at it’s history all over again! SIGH! I’m speechless! Can I visit during Christmas holiday? I love pillows too. They seem to just make everything look comfy and cozy. As always, you have found the best of the best. I think my favorite is the rectangular with “merry” across it. But hard decisions to just pick one or two from so many great ones! Love all the pillows! So hard to decide what my favorites are. I’m really liking the reindeer this year. Such cute pillows. I wish I had more places for pillows! What great pillows! I recently bought #12 and am in love! They are gorgeous! I think I may need to purchase one or two more of your “finds.” I really like the grey Merry Christmas pillow with pom poms from Pier 1. That might be my next one …. Thanks for a great post!! Yvonne, thanks so much for the pillow tour…I selected a pillow for each of my daughters and placed orders. During their Thanksgiving visit with us, I enlist the help of my sons-in-law to tuck away a Christmas pillow into both cars. When unpacking from the trip home, a new pillow is discovered and added to growing collections. It has become one of my favorite holiday traditions. Oh, what a darling thing to do Karen! Ok you are such a tease Yvonne .It is hard to choose…there are all so cute…I love them all.? Thanks for sharing all of the fun pillows….your hard work and efforts pulling all these great pillows and sources together is much appreciated! I love these pillows! They are festive, fun, and fabulous! Thank you! What a wonderful collection! I just love the gray and white buffalo check pillow, along with about 5 more! Enjoy your Thanksgiving along with that handsome baby you’ll be holding! Love the black and white check pillows-hard to choose and want to use for years . Teaching my grand daughter to sew and pillows were a good project. Thanks for sharing! There are wonderful options that would please most everyone. I particularly love pillows that look hand painted. Thank you Yvonne! You’ve turned me into a pillow addict and today you made it so easy to acquire the one with the Christmas tree in the back of the truck for my family room. Cute cute cute. Love your blog! A woody station wagon has always been the vehicle I dream of having. Goes back to when I was growing up I guess so needless to say # 22 is my choice. To be fair I will get # 5 for my husband so he won’t be jealous of my new vehicle. Thanksgiving greetings to you and your family. I love to accent a room with pillows. Thank you for this post! 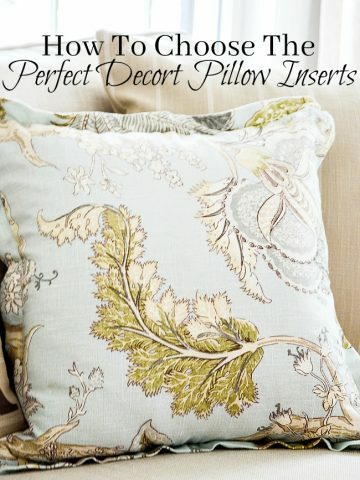 I have a collection of very nice pillow inserts so my hunt is for pillow covers. It’s so much easier for storage. Perhaps you could do a future post on pillow covers? Thank you for sharing your creative talents. I look forward to your posts! What a FUN post. Loved seeing all your pillows; they would make a great gift for special people! Yvonne, These are always my favorite posts of yours. I too am a little bit of a ‘pillow hog’. Just can’t seem to get enough. I had rather switch out and decorate with pillows than just about anything. I am constantly moving them from room to room until I have them where I want them. Thank you for sharing. I love and want them All!!! I just bought #22 and another plaid one from PB. Love them!!! Thank you for sharing the beautiful Christmas pillows. I especially liked seeing your combinations – inspiring! Wow! I am having a hard time deciding which ones to choose! My style can be all over the place! Love the pillows! I bought a classy pillow so far this year. A pillow that says JOY khaki color with the word in jewels! Love it! Good Morning Yvonne, Oh my word, I have just had the most wonderful 5 minutes enjoying all the wonderful cushions. Like you, I adore cushions…. they make me so happy. They can certainly change the look of a room and what better time than now, with Christmas just around the corner. My style is ‘classy and classic’…. I say that with a smile on my face. I would love to enter your competition, I know I live in England, but I will be visiting my daughter, who now lives in Chicago, for Christmas….. and I am so excited. We are both going to browse the shops and enjoy the many wonderful things the shops have to offer. As always, it is a joy to visit you. I’m so fond of my StoneGable friends “across the pond”! I lived in Scotland and England as a child and we loved our time abroad. So many of my most cherished childhood memories live in Scotland and England!Have a wonderful time visiting your daughter here! 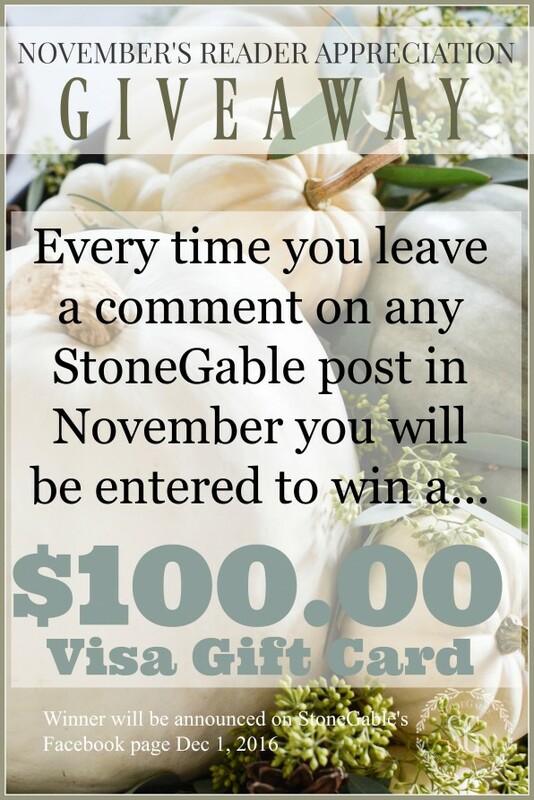 Of course, you can enter to win! Good Afternoon Yvonne, I live very close to the borders of Scotland and we often visit Edinburgh. It is so lovely to hear that you enjoyed your time here in England and in Scotland. I have never visited Chicago before. My daughter tells me it gets very, very, cold so we have to make sure we have warm and cosy clothes. Thank you so much for entering my name for your competition…. it feels very exciting. I love #6, and my sister would love #9. I think my sister even has some Santa hats for her dogs (not that they stay on for long, but they are cute).